Unless you have been living under a rock, you have witnessed the incredible surge in prices for certain collectibles – especially high-end cards. What do most of these collectibles have in common? They are collectibles that relate to the household names. The market is focused on the likes of Mantle and Jordan, Namath and Orr. In the following editorial, PSA’s Joe Orlando takes a closer look at this market explosion and the long term importance of having a recognizable name. Collecting the 1934 Goudey Baseball Card Set – A Cardboard Tribute to the "Iron Horse"
Following their beautiful release in 1933, Goudey came back with another gorgeous-looking baseball card set in 1934. While the set is absent the "Sultan of Swat" – Babe Ruth – it does contain two classic cards of Lou Gehrig, in addition to several cards featuring other Hall of Famers like Jimmie Foxx and Dizzy Dean. In the next piece, we dig deeper into one of the most visually-appealing sets ever made. There is no question that the 1953 Bowman Color baseball card set is considered one of the best-looking issues of all time. Produced during an era that brought collectors such a wide range of baseball card designs, what was it about this particular set that makes it such a standout? While most other Bowman and Topps issues of the era contained colorful artwork and an occasional ornate frame, the 1953 Bowman set went with a simple approach. The classic color photos are pure, with no distractions in the design. In the following article, we talk to the collectors who pursue this desirable hobby staple. During the 1970s, Thurman Munson established himself as one of the top catchers in baseball, along with the likes of Johnny Bench, Carlton Fisk and Gary Carter. Munson was the unquestionable leader of the late-1970s New York Yankees team, which won back-to-back World Series titles in 1978 and 1979. In 1976, Munson would be named the AL MVP in perhaps his finest overall season. Just a few years later, Munson would perish in a plane crash, which cut his career and life much too short. The 2015 winner for the Best Modern Player Set of the Year is the only complete set ever put together in the Munson Master category and it boasts a GPA of 8.56. At 112 cards, the set contains a host of regional and more obscure issues like the tough 1971 Topps Greatest Moments #1 card, in addition to the classic regular-issue Topps cards. Click here to view this set. There are 78 lots of unique memorabilia including game used bats, autographed balls, a contract, trading cards and much more from the life and career of the Sultan of Swat up for auction in the Goldin Auctions Babe Ruth Auction through March 5th at www.GoldinAuctions.com. As part of the company’s long-term exclusive partnership with the Babe Ruth Birthplace Foundation, 5% of each winning bid will be donated to the organization. With 1,500 lots, Small Traditions LLC’s current Spring Training Oddballs & A utographs Auction is the Denver-based auction company’s biggest event yet. The auction is underway and closes on Saturday night, March 5th. There aren’t any five-figure Mickey Mantle or Willie Mays rookie cards – the company is saving those for its April Premium Auction, a sneak peak of which appears below – but up for grabs is a staggering number of graded cards from regional and oddball sets, plus wax boxes, autographs, rare game-worn patch, jersey, and bat cards, and other memorabilia. Auction #50 includes over 500 lots from the four major sports, boxing and non-sports. Nice variety of lots from the 19th Century to modern with Hall of Famers, commons, graded, ungraded, high grade and lower grade. 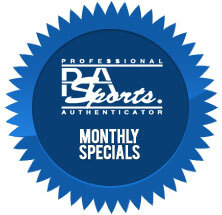 With a nice selection of T202s, T205s, T206s, George C. Millers, autographs and much more! Highlighted by rookie cards of Stan Musial, Satchell Paige, Tris Speaker and Tom Seaver plus HOFers Babe Ruth, Ty Cobb, Rogers Hornsby, Mickey Mantle and more! Auction is scheduled to end Thursday, March 10. Initial bid MUST be in by 8 pm EST to be allowed in extended bidding. There are 831 lots offered in this auction including 1968 Topps #177 Nolan Ryan RC PSA NM-MT 8, 1959 Topps #10 Mickey Mantle PSA NM+ 7.5, 1962 Topps 147 Bill Kenkel Pitching Green Tint PSA Gem MT 10 and more! A 1955 Topps Roberto Clemente rookie baseball card, graded PSA Mint 9, stunned the baseball card collecting hobby on Saturday night, Feb. 20, 2016, when it realized a world record price of $478,000, amidst spirited bidding, in Heritage Auctions’ $9.3+ million Feb. 20-21, 2016 Platinum Night Sports event in New York. 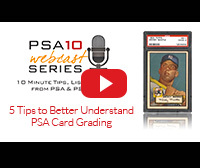 Card Grading Tips from PSA, Using the Classic 1952 Topps Mickey Mantle. Which of the following names do you think is the biggest brand in the hobby?